In what could be described as a formal endorsement, Nigeria’s former military president, Ibrahim Babangida, has urged women and youths in the country to rally behind the Chief Olu Falae led Social Democratic Party (SDP) for the 2019 General Elections. General Babangida made the call in Minna on Saturday when the national leadership of the party, led by its national chairman, Chief Olu Falae, visited the ex-head of state at his hilltop mansion. 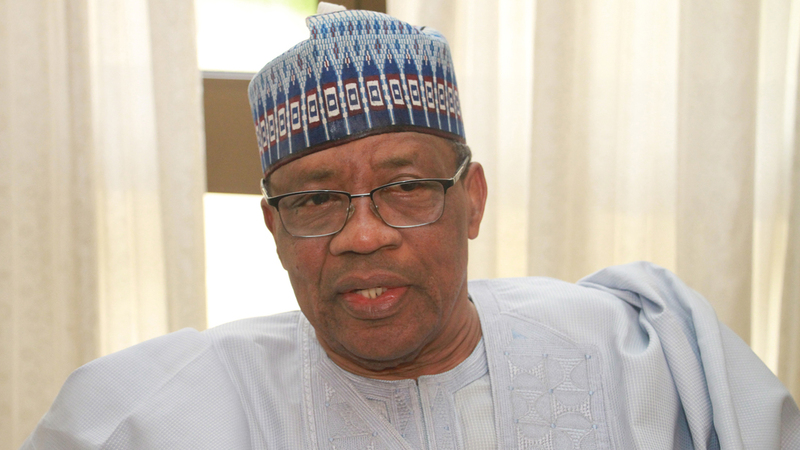 “If I hadn’t being too old, I would have loved to join the youth vanguard of your party,” said IBB, continuing that “I have faith in the political party for what it is and what it stands for. “When I heard in the news that a party has come on board, the first thing that occurred to me was that the name sounds familiar. So I made a decision that I will wait and see how it plays out. I was looking at how the SDP will populate itself. And then the next pleasing thing that I heard was that it has people like Olu Falae, Professor Jerry Gana, Professor Adeniran. “After that I said this party is real, because most of the names are names that I have known and I have worked with for the sake of this country. So I said the party is smart to convince all these gentlemen to come and join it. The former military ruler went on to commend the party, saying: “I know it can be done, I have never said this to any political party before, but I can tell you that the party has people who have contributed a lot to this country, people whose contributions to Nigeria is legendary; and what you have put ahead of you is what this country needs. “So I call on all the younger generation, including Nigerian women, to rally behind SDP because it is populated by men of integrity, men who when they work, they work well, when they speak, they speak well,” Babangida said. While emphasizing the importance of security to the overall development of the country, IBB congratulated Chief Olu Falae for coming out of his abduction ordeal alive, saying: “I want to say that God has kept you for a purpose. You now know how important security is because you were kidnapped. The retired General advised Falae to “remain firm in this your project because the country has a lot to benefit from you. Babangida also advised the leadership of the party to, as a matter of necessity, make its manifesto public to Nigerians so that they can be held accountable. “You must tell Nigerians what you intend to do for them because this is very important. The people must know if we vote SDP what do we expect so that it become politics of issues not politics of insult and name calling,” he said. Earlier, the national chairman of the party, Chief Olu Falae, explained General Babangida that the leadership of the SDP were in his house as part of nationwide consultations, part of which was to brief him on the activities of the party and to equally solicit for his support and counsel. Falae said he decided to come to Minna with the party leadership as its first port of call as a mark of respect because Babangida brought him into political limelight 32 years ago when he appointed him Secretary to the Government of the Federation, and since then he has remained active in national politics. “32 years and four months ago, I had the privilege of sitting with President Babangida for the first time in Council Chamber at the Dodan Barracks, Lagos,” Falae recalled. “So, Babangida recruited me into politics 32 years ago and he didn’t know it was going be permanent because I thought at the end of my tenure, I will return to my banking industry at Broad Street in Lagos. But that was not to be. Till today I am still in politics,” he said. Chief Falae told his host that the SDP was child of necessity, born out of the desire to rescue the country from its present troubles in every sphere of life. “When I was approached to accept all the progressives who have been frustrated from different political parties to come together to form a formidable team to rescue Nigeria, I readily agreed because this country must be rescued from the present state of corruption and impunity,” Falae stressed. He described as unacceptable the killings of Nigerians by rogue Fulani Herdsmen across the country, pointing out that any government that failed to provide security for its people is a failed government. “I am sure you must have heard and read about the killings by the cattle herdsmen and what they did to me. When I was kidnapped, I was machetes all over my body and for four days I was sleeping in the bush. But I thank God I came out because I believed that I am serving a living God,” said Falae, recalling his high-profile abduction. “The current situation is not good enough for this country. I know when I was growing up as a child, the Fulani herdsmen mingled with our people as they grazed and there was no problem at all, so why now? “Since this present government came on board, the herdsmen seem to think that they now own Nigeria, and it is a lie. Their arms must be taken away from them, their minds must be disabused and, while doing that, provisions must be made for them to be able to do their business legitimately so that the rest of us can also do our farming business as well, because both agriculture and animal husbandry are good for the country’s economy. “Nigeria as a country is passing through a terrible time, the present government talks about fighting corruption all the time but corruption today is worse than it was in the immediate past,” said Falae. “When SDP takes over the government in 2019, by the grace of God, we will reduce corruption to the nearest minimum. If I am preaching against corruption and I am stealing money, people will not follow my example. But if I am totally committed to fighting corruption without bias, people will surely take me seriously. Corruption can be fought if we, the leaders, genuinely embrace transparency not what we are seeing today,” he concluded. Olu Falae SAP mess in this natives territory is not forgotten. Their generation of mess under the dead fraudulent political name Nigeria controlled by fulani fraudulent criminal sultanate political government with its emirates has come to and end in this climax of the ongoing Revolution War of the natives under the natives Disintegrated Republics which secures the natives existence and future in 21st century world. A generation of mess who do not know there’s no democracy under the dead fraudulent political name Nigeria, a generation of mess who do not know Sokoto controls Abuja via fulani fraudulent criminal sultanate political government with its emirates, a generation of mess who do not know fulani fraudulent criminals claimed a war victory over northern natives which never happened, and established fulani fraudulent criminal sultanate political government with its emirates with which fulanis subjected northern natives under fulani Political Control and got Democratic Capacity for fulani Political Control over this natives territory under the dead fraudulent political name Nigeria, a generation of mess who do not know fraudulent criminal Britain still controls this territory natives politically via the dead fraudulent political name Nigeria in collaboration with the dead fulani fraudulent criminal sultanate political government with its emirates, a generation of mess who do not know this territory natives existence and future worldwide under the dead fraudulent political name Nigeria controlled by fulani fraudulent criminal sultanate political government with its emirates, is mess- economy, education, employment, job, salary, pension, social securities, business, public infrastructures, amenities etc. It is over for dead fulani fraudulent criminal sultanate political government with its emirates in this natives territory. It is over for the dead fraudulent political name Nigeria in this natives territory. It is over for the enemy’s brainwashed terrorism mercenaries nickname military, police etc. in this natives territory. Only the Sword decides in this climax of the ongoing Revolution War of the natives under the natives Disintegrated Republics which secures the natives existence and future in 21st century world. God Is With Us!!! Igbo men say no to removing Buhari from office!!! same way you removed Jonathan and now want to continue this your political experiment that has failed. It’s time for power to go back to its original owners that’s the the Igbos cause ever since the inferior non Igbo tribes of Nigeria took power from igbos after the civil war, Nigeria has continually regressed. First thing igbo president will pass into law is legalization of prostitution and strengthening of women rights laws. Just like Fulanis love cattle, Igbos love women and are serious advocates of sexual immorality and female promiscuity. The saying goes in Igbo land that it’s in-between promiscuous women’s legs that great civilizations were conceived and achieved if you read Genesis chapter 6 from verse 2. The Igbo master race must be handed over power. If the political environment in Nigeria still revolves around people like IBB, Olu Falae, Pa Adeniran, and other old, wacky, politicians recycling themselves in politics, then the hope of a better tomorrow in Nigeria is in shambles. Nigeria is the new Zimbabwe, where people close to their graves dictates the future of the next generation. SHAME SHAME SHAME.